Concord, California is the largest city in Contra Costa County, California, US. In the 2010 census, 122,067 people lived there. Concord was founded in 1869. It was named Todos Santos at first, but the name was soon changed to Concord. The city is 31 miles (50 km) east of San Francisco. Concord is at 37°58′41″N 122°01′52″W﻿ / ﻿37.97806°N 122.03111°W﻿ / 37.97806; -122.03111. It is 29 miles (47 km) northeast of San Francisco, 22 miles (35 km) northeast of Oakland, 65 miles (105 km) southwest of Sacramento, and 51 miles (82 km) north of San Jose. According to the United States Census Bureau, the city has a total area of 30.5 square miles (79 km2). All of it is land. The center of downtown Concord is Todos Santos Plaza. The plaza takes up an entire city block. It is known for its farmers market, free summer concerts, and many restaurants. There are new apartments and condominiums near the plaza. Concord was first named Todos Santos. In the 19th century, most people in Pacheco moved to Concord to get away from fires and floods. Concord became a city on February 5, 1905. The area around Concord in the Ygnacio and Clayton Valleys was a big farming area. To the east, where the Concord Naval Weapons Station was later built, there were big wheat ranches over 5,000 acres (20 km2). They covered the land all the way to the marshes by Suisun Bay. During Prohibition, many vineyards were removed and replaced with walnut trees. On July 17, 1944, the weapons on a United States Navy ship exploded. This caused the highest number of deaths at a time among African Americans during World War II. The explosion killed 320 people. The explosion was felt 30 miles away. Later, 258 African American sailors refused to load any more weapons. That was the start of the Navy's biggest-ever mutiny trial. In that trial, 50 men were found guilty. Future Supreme Court Justice Thurgood Marshall was at the trial. He said that he saw a prejudiced court. On December 23, 1985, a small airplane crashed into the roof of Sunvalley Mall. The pilot and two people on the plane were killed. 84 people in the mall were hurt, mostly from burning fuel. Four of the people in the mall later died from their injuries. The accident made more people be against the local airport. Pacific Southwest Airlines delayed starting passenger service there that had been planned for the new year. North of the city of Concord is the Concord Naval Weapons Station. It was opened in 1942. During World War II, weapons were kept there. The weapons were for warships at Port Chicago. The Concord NWS helped war efforts during the Vietnam War and through the end of the Gulf War, taking care of equipment and supplies. The station has two main areas. One is the Inland Area, 5,170 acres (21 km2), which is inside the Concord city limits. The other is the Tidal Area, 7,630 acres (31 km2). Because of changes in military operations, parts of the Inland Area stopped being used. By 1999, the station had only a few military people working there. In 2007 the United States government decided to close the inland part of the station. The Tidal area of the base stayed open. The city of Concord is working on a plan for how to use the land. Their plans will have to be approved by the Navy. Until 1995 the city was the eastern end of the Concord line of Bay Area Rapid Transit (BART) commuter train system. Since then, more track was built. BART now goes farther than Concord. Bus service runs in the city and other points in the county. Interstate 680 goes through Concord. So do state highways 4 and 242. 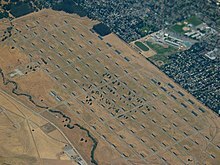 Buchanan Field Airport is a public county-owned airport in the City of Concord. It currently does not have any scheduled passenger service. It was once served by WestAir, Pacific Southwest Airlines, and later U.S. Airways for a short time. In 1977, Buchanan Field reached its peak of activity with 357,000 total operations making it the 16th busiest airport in the nation that year. De La Salle High School, for boys. De La Salle's football team set a record by winning 151 games in a row between 1992 and 2004. The Concord Jazz Festival is held every year..
Concord is also home to the 14-time World Champion Blue Devils Drum and Bugle Corps. The corps is made up of talented musicians from around the world. The Concord Blue Devils are the most decorated drum and bugle corps in the history of Drum Corps International. Sleep Train Pavilion - a major concert venue formerly known as the Concord Pavilion, and also as Chronicle Pavilion at Concord. Camp Concord, at South Lake Tahoe, a family-oriented Summer Camp, although not located in Concord, is operated by the city. In 1974 Concord became a sister city with Kitakami, Iwate, in Japan. The city built a small park in the city, and put half of a sculpture, The Communion Bridge, in it. The other half of the bridge is in Kitakami. ↑ "Mayor and City Council". Concord CA. Retrieved April 7, 2018. ↑ Allen, Robert L. (2006). The Port Chicago Mutiny. Berkeley, CA: Heyday Books. p. 118. ISBN 978-1-59714-028-7. OCLC 63179024. ↑ 7.0 7.1 About the City of Concord Community Reuse Project, official city web site'. Retrieved 2007-08-13. ↑ "Concord Naval Weapons Station". Contra Costa Times website collection of articles. Retrieved 2007-08-13. Wikimedia Commons has media related to Concord, California. This page was last changed on 28 October 2018, at 13:58.